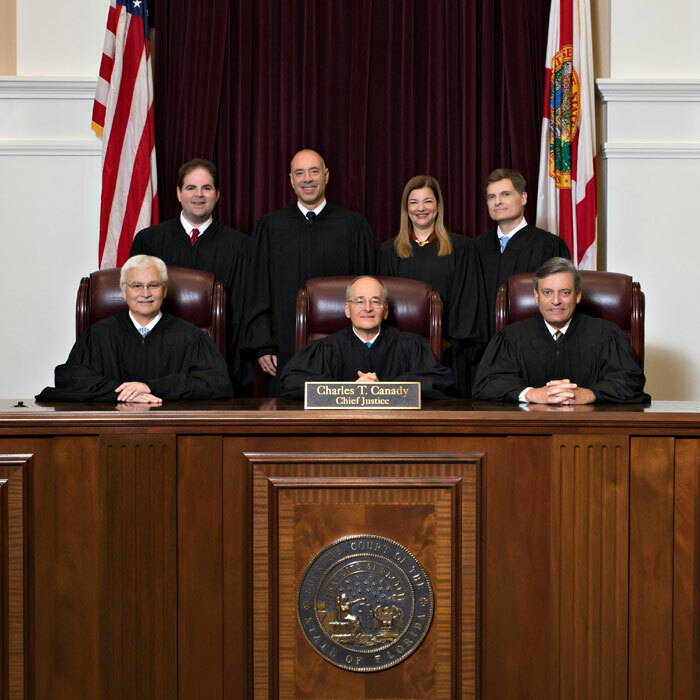 The Florida Supreme Court moved to its current location, the Supreme Court Building, in 1949. The Court met in the Old Capitol Building from 1845-1912 and in an earlier Supreme Court Building from 1912-1949. An old aerial photograph in our on-line collection shows the old building on its site in what now is a roadway in downtown Tallahassee. Unfortunately the building was not preserved. Before 1912, the Court met in a space provided in the Capitol Building. The Court meeting place in the old Capitol has now been restored to the way it appeared in 1902. The restoration is quite interesting, because it was able to preserve so many original pieces of furniture from the old Court. The tables, railings, gates, portraits, and the Justices' bench are all originals. Much of the credit for saving these items from being scrapped or sold as surplus goes to Marilyn Overton, wife of retired Justice Ben F. Overton. The 1948 building (the front section and middle wing) was dedicated on December 29, 1948. The architectural style includes Jeffersonian Greek Revival elements, most especially the dome. In keeping with this motif, the rear portico of the building also is of a noticeable Greek Revival style. Much of the original building walls were cast in monolithic concrete, a process of pouring concrete into large wooden molds. This method is seldom used today because of the difficulty and expense. At many points throughout the building, these walls are nearly two feet thick. In the library's basement level, woodgrain imprints from the original molds still can be seen in the massive concrete walls. The facings on the exterior front of the building were molded as part of these walls. The foundation rests on piles driven deep into the clay hill shared with the Capitol building. At the time the 1948 building was completed, Egyptian Revival was in style, and many of the original furnishings were of this motif. Some of these furnishings are still in use in the courtroom and elsewhere in the building. Embedded in the rotunda floor is a replica of the Court's seal surrounded by eight marble columns. (The number of columns has no historical significance). The marble in the column shafts is Maryland Verde Antique, quarried near Cardiff, Maryland, and the white caps and bases of the columns came from a quarry near Carrara, Italy. The carving was done by craftsmen of the Candora Marble Company, Knoxville, Tennessee. The steps that begin at the entrance of the building and culminate at the entrance to the court room were designed to emphasize the prestige and dignity of the Court. 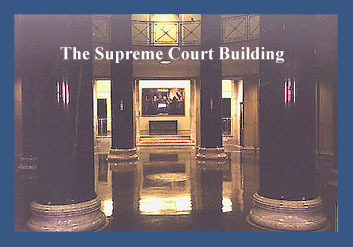 Architects for the Supreme Court Building were James Gamble Rogers II of Winter Park, Florida, and Yonge & Hart of Pensacola, Florida. The 1948 building was constructed by the J.A. Jones Construction Company. The building was dedicated in an elaborate ceremony on December 29, 1948. Historical documents and photographs were deposited in the new building's cornerstone. The price of the building in 1948 was a mere $1.7 million, which was considered "steep" at the time. In fact, there was public controversy about the amount at the time. Today it is doubtful whether the marble columns alone could be commissioned for that amount. Our photo collection includes a postcard photograph taken around 1960 that shows the original Court Building. By the 1980s, the building had developed problems caused by lack of adequate state funding. Many original design elements of the 1948 structure actually contributed to the problem. For example, the original building had been built with internal rain gutters placed inside the concrete walls. These gutters in turn flowed into a series of underground cisterns that operated much like septic tanks. Through the years, these cisterns had collapsed underground, resulting in a serious problem: When it rained heavily, water would back up inside the rain gutters and then eventually flow out into the Court's attic. Compounding the problem, the original copper roof also had begun to leak badly in places. Moreover, the fixtures and furnishings in the building also were worn, and the Court's "security system" was virtually nonexistent. In early 1987, for example, people visiting the building would have felt they had taken a step back in time. Carpets were worn to threads in places. Much of the building's original collection of spittoons still could be seen in places, noticeably the men's rooms. Light fixtures in the rotunda area either had ceased working or were fire hazards. The building also had a substantial quantity of asbestos in its ceilings and walls, used in 1948 before people fully understood its hazards. Worse still, the entire duct system had been covered in cork, which was considered a serious fire hazard by local fire marshals. Security in the building also was a problem. Under the original 1948 plans, the building had been built with a large number of entrances, and many of these still were accessible to the public. It was not unusual for people to simply walk in off the street and wander directly into a Justice's office without challenge. In 1948, of course, this kind of open-door policy was considered "just being neighborly." Today, the situation is entirely different. Several Justices, for example, have received threats serious enough that Florida law enforcement officers were assigned to them on occasion. In 1974, a bullet was fired into one of the heavy metal doors at the entrance to the courthouse, leaving a bullet hole that remained in view until the doors were replaced. By the mid-1980s, funding still had not been obtained to eliminate the building's many problems. As a result, employees in the building actually had to be assigned the duty of covering the desks of Justices and lawyers and the upper-floor library books with plastic sheeting. In many offices on the upper floor, employees routinely spread sheeting over their desks every Friday afternoon at quitting time. Under Chief Justice Parker Lee McDonald, the Court resolved to pursue funding more vigorously in the late 1980s. Justice Rosemary Barkett was assigned to pursue the project. For quite some time the effort seemed doomed to failure, because the Legislature was preoccupied with the new Bob Martinez administration, the approval of the Florida Lottery, and a proposed new tax on services. Then in early 1988, a reporter from The Tallahassee Democrat called for an interview with Justice Barkett about a completely unrelated matter. By pure happenstance, the reporter arrived on a day when it was raining very badly outside. And by another coincidence, water was pouring from the Justice's ceiling at the time. The reporter thus witnessed an unusual sight: a Justice's office covered with plastic tarp and filled with wastebaskets to catch water. Members of the Court quickly explained the building's numerous problems. For example, official Court files in Justice Joseph Boyd's office once had been ruined during a rainstorm, and other Justices' offices also had a recurring problem with leaks. Forgetting her original interview topic, the reporter summoned a photographer and prepared a story on the sorry condition of the Supreme Court building. Within days, the Chair of the Senate Appropriations Committee, Pat Thomas of Quincy, arrived to inspect the building, and he brought a present for Justice Barkett -- an umbrella. As a result, in 1988 the Legislature authorized and funded additions and renovations to the building. Barnett Fronczak Architects were the architects, and Metric Constructors, Inc., was the general contractor. The additions and renovations were completed in 1990, and the Court convened in ceremonial session on November 20, 1990, to celebrate the completion of this project. The 1990 renovations were extensive. Not only were repairs made, but two new wings also were added at the rear of the building. Unlike the 1948 building, these wings were constructed without the use of monolithic molded concrete. The foundation also did not rest on pilings. As a foundation, a massive hole was dug into the clay hill and was replaced with a special mixture of compacted soil. On top of this was laid a large concrete slab designed to spread the building's weight across the new soil. The superstructure of the building was built of structural steel. Even the internal non-load-bearing walls are made of steel faced with gypsum board. The architects and contractor were very successful in matching the external facings of the new wings to those of the 1948 building. However, these facings are made of molded concrete bolted onto the superstructure. As in the 1948 building, the roof of the new wings is made of copper sheeting that will become coated with verdigris as it ages. One unusual aspect of the renovations involved the creation of two open-air courtyards that are surrounded by the old building and its new wings. To create these courtyards, a massive amount of the hillside was dug away, creating courtyards nearly two stories underground in some places. New windows also were added around the courtyard, including in portions of the 1948 building previously underground. However, these windows posed special problems, because they had to be cut out of concrete that was nearly two feet thick. The contractors found and hired a company that specialized in large sawing operations. For weeks, this company employed enormous saws to cut the new windows out of the original concrete. Creating a single window could take many days of such work. The Court's longstanding security problems also were eliminated by a variety of new security measures. When the new wings were finished, the time came to decide exactly how the renovated building would be painted. This question, in turn, involved a very old capital custom. For years, tradition had dictated that all government buildings be painted institutional white. The Supreme Court itself was entirely whitewashed until 1990. However, the architects pointed out that solid white did very little to highlight the impressive architectural details of the exterior. Ultimately, the Court accepted the architects' idea of abandoning the all-white color scheme. Instead, the building now would be painted a light beige, but with the architectural detail highlighted in white. Moreover, the windows would be emphasized with a single band of red. Our on-line photo collection includes before and after photos. This new color scheme created some initial shock in Tallahassee, where no one had ever before challenged the all-white tradition. However, local newspapers praised the new color scheme, and the controversy eventually died away.